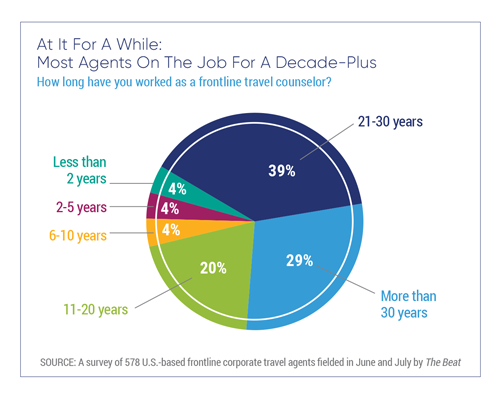 It may surprise industry outsiders to learn that frontline travel agents remain a vital force in corporate travel. They weren’t wiped out by the Internet. They weren’t erased by self-booking tools. And, no, artificial intelligence and bots aren’t taking over anytime soon. At most travel management companies, frontline counselors represent the largest single employee group. Each day and in droves, these counselors work to solve managed travelers’ problems: fielding questions, making reservations, de-escalating tensions and mitigating trip disruptions. They remain essential to the service-delivery mission of corporate travel agencies. According to conversations with TMC executives, a review of U.S. Census Bureau data and a look at tenure profiles of respondents to The Beat’s survey, a wave of Baby Boomer retirements is washing over a sizable portion of the TMC frontline. Paul English’s roots are in travel e-commerce. He co-founded metasearch operator Kayak, which sold to Priceline. He since has founded Lola, a well-funded startup that targets business travelers and lightly managed programs with mobile travel booking and support technology commingled with artificial intelligence and chatbot interactions. It’s a “virtual assistant,” but not entirely virtual. As of early September, the company had a small team of travel counselors and job listings for more. TMCs face challenges attracting new employees to a profession saddled by a no-future perception. Hiring managers are on the prowl for a different skill set than they were a generation ago. Knowledge of cryptic commands in global distribution systems and memorization of airport codes no longer are essential, given advancements in point-of-sale technology. The TMC frontline employee is changing, and so is their identity. 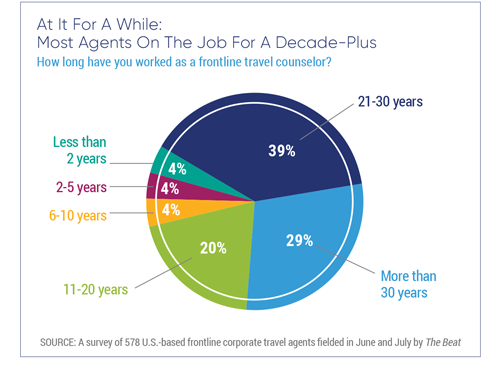 Many TMC operations folks, hiring managers and frontline employees have moved on from the label “agent.” They increasingly favor “advisor,” “associate,” “consultant,” “counselor” or “specialist.” To wit: the American Society of Travel Agents in August rebranded as the American Society of Travel Advisors. No matter the handle, the TMC frontline is not homogeneous. Depending on a TMC’s structure and employee hierarchy and the skill set or tenure of a given counselor, frontline workers can assume various dedicated roles. 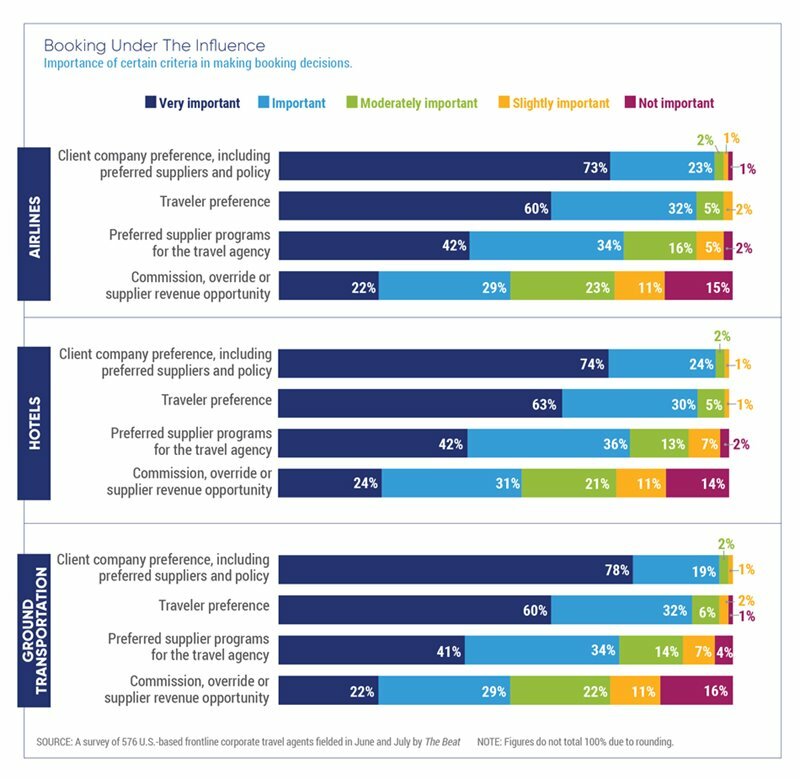 Roughly three-quarters of frontline corporate travel advisors surveyed by The Beat indicated they are either “very satisfied” or “satisfied” with their job. Ambivalence strikes another 13 percent, while 11 percent viewed their jobs negatively. While these agents work for a variety of TMCs, report to a variety of managers, have a variety of coworkers and service a variety of clients—all things that can influence job satisfaction—a few themes emerged. Among the contented, one derived satisfaction from “a feeling that I am making a difference and helping others.” Others echoed the sentiment. “I take pride in my work, and feel I do a very good job,” said one. 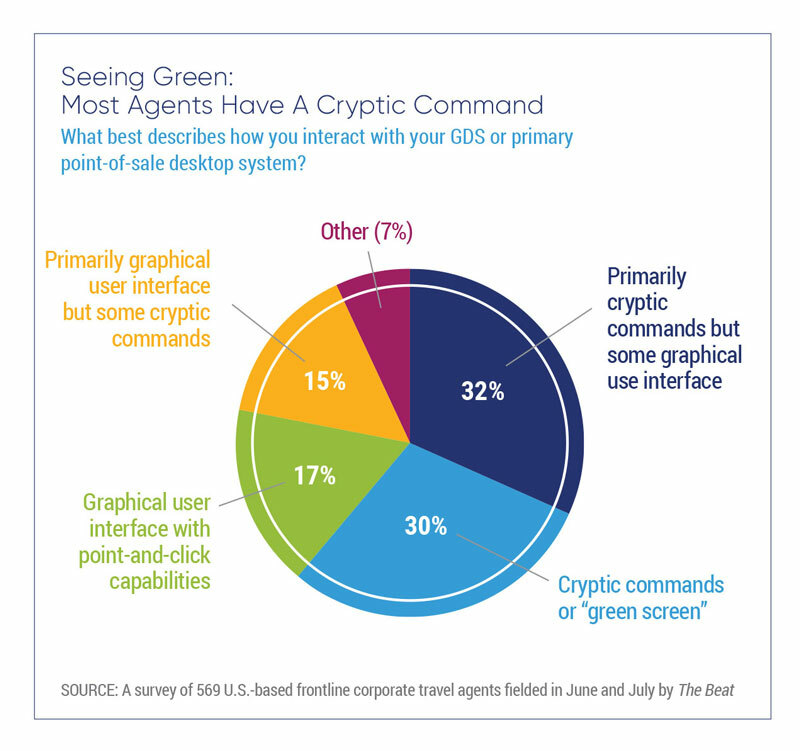 There’s a reason the text-based codes many agents use to command these screens is called “cryptic.” It definitely mystifies outsiders. Its MS-DOS-like jumble of text and monochromatic background looks antiquated. “Traditionally, the only frontline tool [agents] had was the GDS,” said Ovation Corporate Travel SVP of operations Isabel Torres. Times have changed. Asked about the set of tools agents use today, she painted a picture of a two-monitor cacophony of apps, popups, widgets and websites. 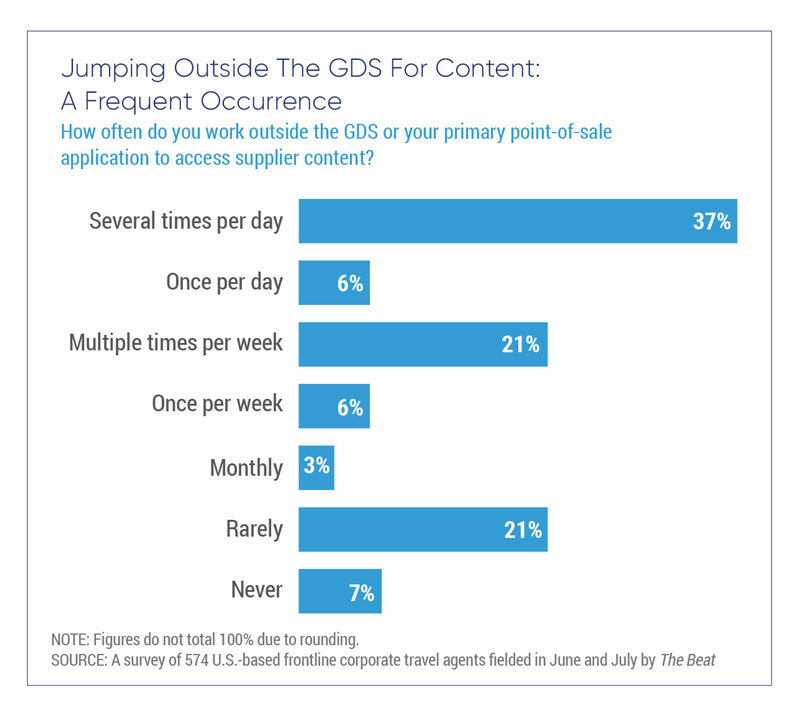 Among respondents, 37 percent said they hop outside their primary system multiple times per day to access supplier content. A further 27 percent shop and book outside these systems once per day or multiple times per week. But 28 percent said they “rarely” or never work outside their primary point-of-sale application. 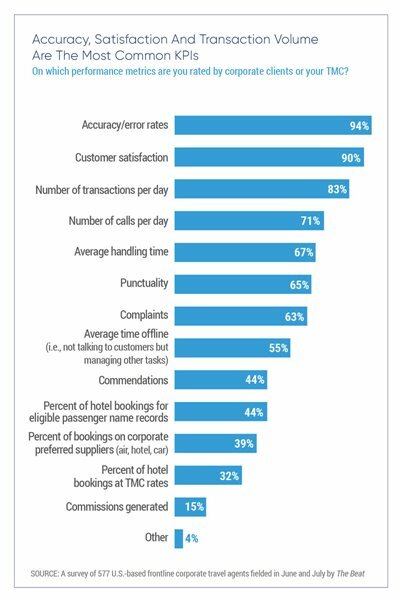 Airfare content satisfies: 85 percent were either “satisfied” or “very satisfied” with their ability to search and book fares on the systems provided by their employers. In two demos, a system of AI technology made a hair salon appointment and called a restaurant for a reservation. The eerily human voice didn’t miss a beat talking to a live person on the other end. Duplex even incorporated common verbal tics like “hmm” and “uh” for a lifelike interaction. 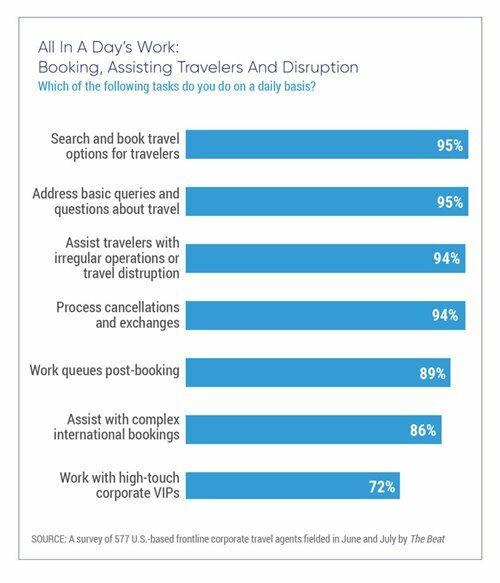 In June and July 2018, The Beat invited hundreds of prequalified U.S.- based frontline travel agents who work on behalf of travel management companies or ARC-accredited Corporate Travel Departments to complete an online survey. In addition, The Beat enlisted several travel management companies, including BCD Travel, AmTrav Corporate Travel, Balboa Travel and Travel and Transport, to distribute the survey link to their U.S.-based frontline counselors. In total, more than 800 respondents completed the questionnaire. Of them, 578 satisfied The Beat’s screening criteria by identifying themselves as frontline travel counselors or advisors who work on behalf of a travel management company or Corporate Travel Department and assist managed travelers with reservations, queries and in-trip assistance. Further, The Beat included responses only from those who indicated that at least 75 percent of the business they handled was related to corporate travel. The Beat supplemented these statistical findings with interviews and conversations with TMC executives, technology providers, industry consultants and frontline agents—some for attribution, others on background. As with all editorial undertakings, The Beat developed, conducted and produced this research project with complete editorial independence. The Beat is the must-read digital publication for senior-level corporate travel professionals, providing breaking news, insightful views and compelling interviews on corporate travel distribution, travel management and technology. The Beat serves an audience of more 10,000 through its paid-subscription newsletter and website. Copyright © 2018 Northstar Travel Media, LLC.